Raymond P. Shafer ’38, the second Allegheny alumnus to preside over his alma mater, was also the first Alleghenian to become governor of Pennsylvania. Following the departure of Dr. David Harned in July 1985, the College needed an acting president who could provide leader­ship especially with alumni and the capital funds campaign. Shafer was a natural choice, as a former member of the Mead­ville community, an experienced administrator, and above all an active alumnus. He was well informed about­ the College, for he had served on the Board of Trustees since 1964 and had chaired it from 1972 to 1981. Shafer responded to the call, agreeing to serve for up to two years while a na­tional search for a new College executive was undertaken. His multifaceted service to the College over many years was so extensive that the Board in gratitude named him president nunc pro tunc upon the completion of his year as acting president. 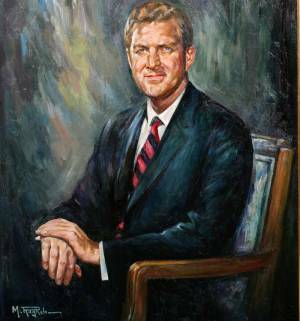 As David Harned technically retained his title as president until June 30, 1986, the 1985–86 academic year from a retroactive viewpoint, but not actually, appears to have hosted simultaneously two presidents of the College. Born on March 5, 1917, in New Castle, Pennsylvania, Shafer completed his high school education in Meadville when his family moved there at the start of his senior year, and then he matriculated at Allegheny College. He served as class president for each of his four years and for one year was the elected head of the Allegheny Undergraduate Council. He was an accomplished athlete. In three of his four seasons as a basketball player he was the team’s high scorer. On February 14, 2004, his number 24 basketball jersey was the first in the history of the College to be permanently retired. During one of the four years Shafer played varsity soccer he achieved the rank of All-American. Shafer won his ninth varsity letter in track and field. An able student, the genial cheer­leader of the class of 1938 graduated Phi Beta Kappa. He ob­tained a Doctor of Laws degree from the Yale University Law School in 1941 in a class noted for the careers of its graduates, including future Supreme Court Justice Byron White and future U.S. President Gerald Ford. During World War II Shafer was a naval intelligence officer and skipper of a PT boat, earning Bronze Star, Purple Heart, Philippine Libera­tion, and Navy Commen­dation med­als. He continued in the USNR and retired from it as a lieutenant commander. Shafer had begun private law practice before entering the Navy, and in 1945 he cofounded what became a successful law firm in Meadville. He taught business law at the College on a part-time basis, and from 1948 to 1956 he was district attorney for Craw­ford County. In 1959 he won election as state senator for the Fiftieth District. After four years in the Senate, he ran for lieutenant governor on the success­ful Republi­can ticket headed by William Scranton. In 1966 Shafer was elected governor, serving from 1967 to 1971. His programs bolstered educa­tion, improved the high­way system, and recruited new industries. The state judicial system was reorganized and steps for environmental protection taken. During his term Pennsylvania enjoyed low unemployment rates, rising per capita income, and an influx of new industries. As governor Shafer took on a daunting challenge: revision­ and modernization of the commonwealth’s obsolete constitution. Though predecessors had found excursions in this direction endangered by po­litical quicksands and electoral pitfalls, Shafer persevered and won ap­proval for creation of a con­stitutional con­vention and acceptance by referen­dum of the document it created. During his gubernatorial term Shafer chaired the Republi­can Governors Associa­tion, was an executive committee member of the Republican Governors Conference, and headed its Law and Justice Commit­tee. The constitution under which Shafer was elected stated that gov­er­nors could not succeed themselves. Upon leaving his gubernatorial post, he accepted appointment by U. S. President Richard M. Nixon as chair from 1971 to 1974 of the National Commission on Mari­juana and Drug Abuse. The report it issued was at the time con­troversial, yet in later years was recognized as correct in its assess­ment of the growing problem. In 1971 he also chose to become chairman and chief executive officer of the Tele­prompter Corpo­ration. From 1975 to 1977 Shafer served as counselor to the vice president of the United States, Nelson Rocke­feller. Upon retirement from that post, Shafer stayed in Washington, D. C., as partner and senior counsel­or for nation­al and in­ternational affairs for Coo­pers and Ly­brand until called to Allegheny. As Shafer wrote in his July 1986 farewell report to the trustees, his year as president was “a period of building and re-building among the College’s several constituencies: students, faculty, alumni, staff, and the business and foundation communities.” His two other principal missions were the completion of Phase I of the Campaign for Allegheny College and the recruitment of a new president. The interim president’s focus was therefore more on the College’s future than on its daily operation. Shafer was indefatigable in fund recruitment. His energy and enthusiasm gave the campaign a needed boost. By June 1986, the College had exceeded the $20 million goal of Phase I by $3 million. The annual fund reached a new record of $1,131,000. Midway through Shafer’s term an issue arose that stirred student and faculty concern: College portfolio investment in firms that did business in South Africa, where a system of apartheid and white dominance over the black majority held sway. Shafer did not grasp how this matter might erupt into a major issue, and his staff failed to alert him. The real debate came later. In 1988 Shafer be­came counsel to the law firm of Dunaway and Cross. He subsequently returned to Meadville and participated in College affairs until ill-health curtailed his activities. Death occurred on December 12, 2006. Shafer’s public service involved work on many national and inter­nation­al boards, in­cluding chairing the National Committee on United States–China Relations from 1982 to 1991. He received many honors, including thirty-five honor­ary de­grees and, in 1972, the Gold Medallion from the Society for the Family of Man. In 1981, upon his retirement as chair of its Board of Trustees, Allegheny named the auditorium of its Fine Arts-Campus Center in his honor. Shafer achieved the thirty-third degree of Freemasonry. In 2002 he was inducted into the Verizon Academic All-American Hall of Fame for those whose sports careers predated the Academic All-America program founded by the organization of College Sports Information Directors in 1952. Through a notable ca­reer, he remained loyal to the shaping influences of his youth: family, faith, teamwork, scouting, and Allegheny College. *This account is taken with permission nearly completely from J. E. Helmreich, Through All the Years: A History of Allegheny College. Meadville, PA: Allegheny College, 2005.